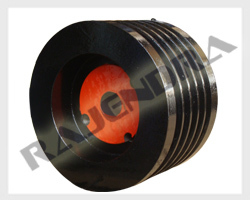 Rajendra Pulley provides pulleys which are critical and important components of power transmission. It helps in transfer the power. We do have variety of pulleys like like V-Belt Pulley, Timing Pulley, Taper lock Pulley, Chain Pulley etc. We offer an wide range of Taper Lock Pulleys having excellent lubrication and easily withstand the excessive wear and tear. Easy to install and use, these taper lock pulleys can also be made as per the client's requirements. Do not look at it that manufacturers recommend every 90,000 - 120,000 miles. Timing belt change should be done every 60,000 miles. Breaking the timing belt is associated with the renovation of the engine. I know this from experience, because I once broke a timing belt. Awesome post...its really very nice blog. Some useful information shared about your services. Hi! I am new to your site. But really take pleasure in it. Your post is quite informative, I just to add Circular Technologies is an established US manufacturer of Bearings and Urethane Rollers. Thanks for your ideas. You can also find the details on Drive Parts Direct, at the Metal Parts Taper Lock Pulleys SPB Section. Drive Parts Direct aims to provide you with a convenient “one stop shop” for all your Power Transmission component requirements.